Life Before the Dinosaurs: Tiktaalik. The story behind the discovery of the fossils in the Canadian Arctic is a really good one. Neil Shubin (who lead the team) wrote an amazing book called "Your Inner Fish". I have ready many popular accounts of evolutionary biology, and Your Inner Fish really brought a lot of things into focus for me, in a very fun way. If anyone has not read this book, I highly recommend it. Thank you. We don't have that one, so I just ordered it for Art. I'm loving all of these posts, and learning a lot. 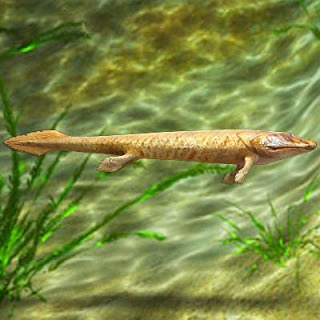 I especially liked this one; Tiktaalik has been a favourite ever since I first heard of it from another person working on it, Per Ahlberg. Keep up the good work, Art! One of the coolest fossils ever. 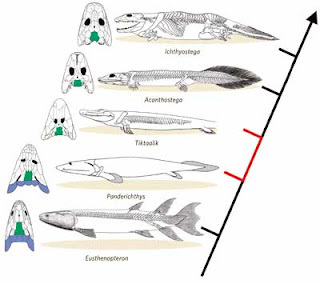 Tiktaalik is one of the clearest examples of a "transitional form" (although everything is transitional), and it's one of those key pieces in the great puzzle of life.